FedEx Express (Memphis), an operating company of FedEx Corporation (Memphis), yesterday introduced its new Boeing 767-300 cargo jet scheduled to begin service this fall. The aircraft is the first of several new 767-300 freighters being added to the FedEx fleet, and represents a major step in the company’s strategically important aircraft fleet modernization program. 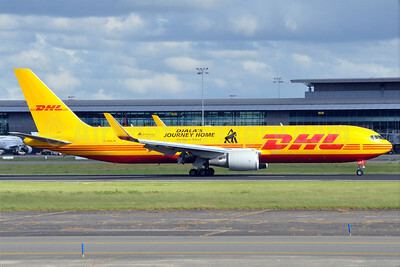 The 767-300 joins 777s and 757s in the company’s growing fleet of more efficient, lower-emission freighters. With the 767 freighter, FedEx is also introducing a new “efficient container” or Unit Load Device used to hold individual packages on the aircraft. The FedEx Efficient Container is lighter and its construction includes more recycled materials. Under its aircraft fleet modernization program, FedEx began upgrading its fleet in 2007 with the addition of 757 freighters to replace 727s. The final 727 in the FedEx fleet was retired in June. 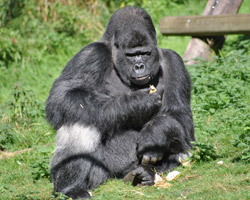 Copyright Photo: Duncan Kirk/AirlinersGallery.com. Boeing 767-3S2F ER N101FE (msn 42706) taxies at Paine Field near Everett. N101FE was delivered to FedEx on September 4, 2013. This entry was posted in FedEx Express and tagged 42706, 767, 767300, 767300F, 7673S2F, Boeing, Boeing 767, Boeing 767300, Boeing 767300F, Everett, FedEx, FedEx Corporation, FedEx Express, N101FE, PAE, Paine Field on October 19, 2013 by Bruce Drum. On September 3, 2010, our industry lost two fellow aviators when UPS Flight 6 crashed near Dubai, United Arab Emirates (UAE). The UAE General Civil Aviation Authority (GCAA) released its final report concerning the investigation into this fatal crash. The GCAA, while not pinpointing the origin of the fateful blaze, determined that the ensuing fire was promulgated by lithium batteries and found that smoke-detection equipment took too long to alert the crew. Copyright Photo: Duncan Kirk/AirlinersGallery.com. 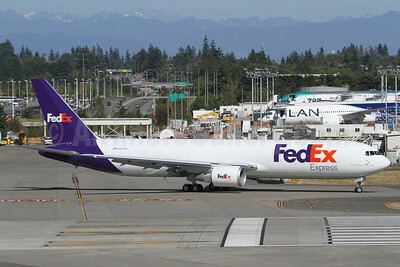 The first Boeing 767-300F for FedEx Express is being prepared for its first flight at Paine Field near Everett, WA. 767-3S2F N101FE (msn 42706) taxied to the runway yesterday afternoon. This entry was posted in FAA, FedEx Express and tagged 42706, 767, 767300, 767300F, 7673S2F, aviation, Boeing, Boeing 767, Boeing 767300, Boeing 767300F, Everett, FAA, federal aviation administration, FedEx Express, N101FE, PAE, Paine Field, transportation on July 27, 2013 by Bruce Drum. UPS Airlines (United Parcel Service) (Atlanta and Louisville) has unveiled a new look for its flagship Boeing 767 fleet by adding winglets as a part of its sustainability efforts to save fuel and reduce emissions. These wingtip devices, which are arrow-shaped surfaces attached to the tip of each wing, enhance the overall efficiency of the aircraft, saving fuel by reducing drag while also lowering noise emissions by improving take-off performance. The modifications will save UPS more than six million gallons of fuel each year and reduce carbon dioxide emissions by more than 62,000 metric tonnes. UPS estimates approximately a four percent fuel savings on each 767 flight. UPS currently operates 54 of the 767 aircraft with five on order. The company plans to have winglets on all 767 aircraft by the end of 2014. Winglets are already installed on UPS’s 747, and MD-11 fleets, and the A300-600 has a similar device called a wingtip fence. The modifications will add approximately five and a half feet of span to each wing, and each winglet is 11 feet tall. Aircraft weight will increase by nearly 3,000 pounds due to the weight of the winglets and the extensive structural reinforcement of the wing structure. Even at this size and weight, the winglets will still reduce the amount of fuel used per flight. Winglets improve the aerodynamics of the wing by extending the length of the wing and reducing the amount of drag, which is the force that opposes an aircraft’s motion in the air. The winglet project is a sustainability initiative implemented by UPS Airlines. The company already operates one of the cargo sector’s youngest and most fuel-efficient air fleet, and is working to reduce its carbon intensity an additional 20 percent by 2020 from a 2005 baseline. Other highlights of the airline’s fuel conservation efforts include computer-optimized flight routes, aircraft taxi time management, and alternate-fuel ground support equipment. Copyright Photo: Joe G. Walker. The first, Boeing 767-34AF ER N304UP (msn 27242) lands at Boeing Field (King County) in Seattle with the new device. 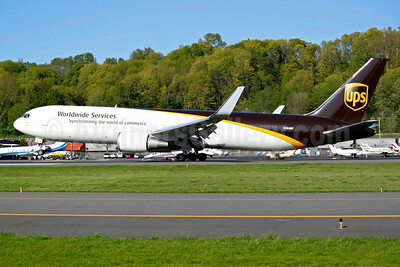 This entry was posted in UPS Airlines, UPS-United Parcel Service and tagged 27242, 767, 767300, 767300F, 76734AF, aviation, BFI, Boeing, Boeing 767, Boeing 767300, Boeing 767300F, Boeing Field, King County, N304UP, transportation, United Parcel Service, UPS, UPS Airlines on May 8, 2013 by Bruce Drum.